A new offering from L'oreal are the 'Rouge Caresse' range, a sheer moisturising lip colour. These have been largely compared to the Revlon Lip Butters, as they are both moisturising with amazing pigmentation. The packaging is really nice and sleek, I like that the handle part is clear it is different to anything else I have. The colour I picked up is 03 Lovely Rose, a gorgeous baby pink colour which is very build able and creamy and extremely wearable. I personally did find this more mositurising than the Revlon Lip Butters I own, but the consistancy of Lovely Rose feels more waxy when you apply it than soft and balmy, so I think these would last better in the heat than the Revlon Lip Butters. 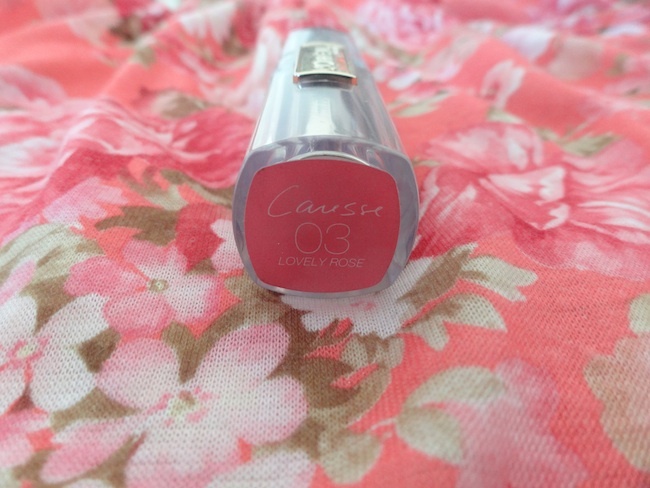 The Rouge Caresse's have the same perfumed scent as the other L'oreal lipsticks but with this lip colour once applied you can't smell it really. Over all I really like this lip balm/lipstick and think it is different enough to the lip butters to justify owning many of both ;) I have my eye on Daring Coral which looks like a very wearable coral who can say no to that?! Does anyone own any of the L'oreal Rouge Caresse's? Finally Found the Revlon Lip Butters! 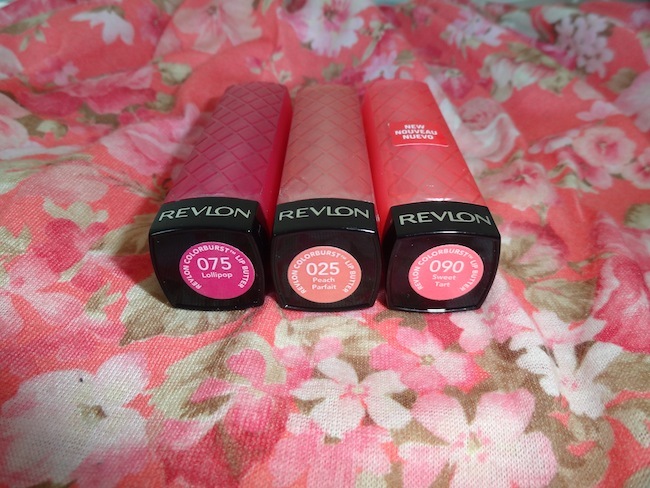 As the name says I have finally got my hands on some of the much hyped about Revlon Lip Butters. Now these things seem to be hard to get hold off they don't seem to have been rolled out in all Boots stores, I have been searching in London and found none, but when I popped into a Boots in Sussex I found loads! So it is worth searching around :) These are the infamous new lip products a moisturising balm with the pigmentation of a lipstick, and I can honestly say I see what all the hype is about with them they are real gems! Due to Boots currently having a 3 for 2 deal across all of make up lines it would of been rude not to pick up 3 ;) ha ha! Peach Parfait - This one is the sheerest of the three lip butters I picked up and is the most natural one. It is a gorgeous light peach colour with quite a bit of gold shimmer running through it but it looks so lovely on the lips, for a touch of colour. As with the other two it is smooth and creamy to apply just like a balm and this one lasts about 2 hours on my lips. 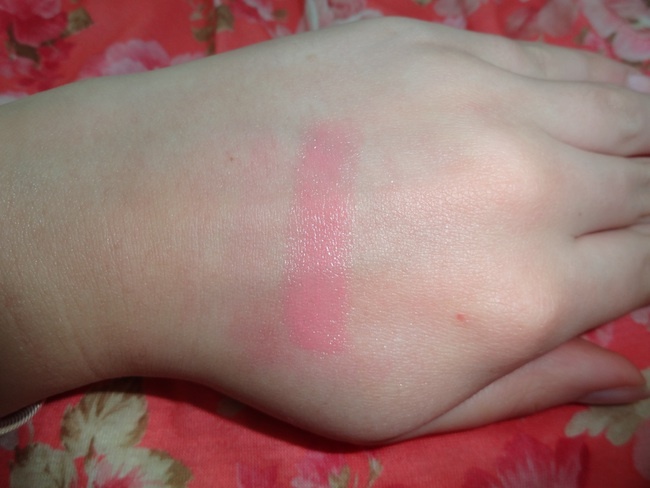 Sweet Tart- This shade is a gorgeous baby pink colour and it really pigmentated. 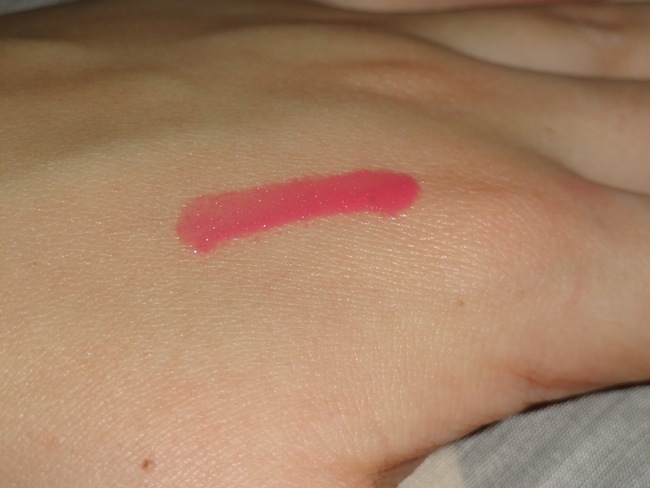 This is a shade I can see me wearing every day as shade wise it is on the same lines as my favourite lipstick of all time Mac Lovelorn all though it is not an exact dupe. 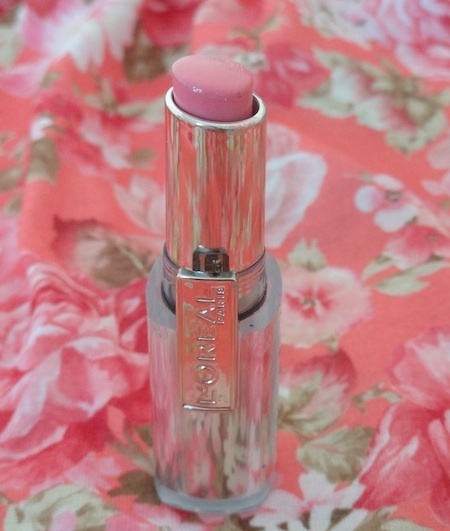 This really does glide on so easily on my lips and is very comfortable and easy to wear. I get around 2-3 hours wear out of this colour. Lollipop - Last but by no means least is Lollipop. Now this one has quickly become my favourite and is the most pigmentated out of the three I picked up. This is a gorgeous fushica pink with tiny silver shimmer running through it, it is perfect to wear in this lovely weather we are currently having! This shade really reminds me of Mac's Girl About Town all though not as fushica and more wearable. Again the colour lasts around 2-3 hours on me but it does leave a nice stain to the lips. Over all I am hooked! I love the quilted pattern on the packaging, the sleekness of them and how they apply. I have jumped onto the lip butter bandwagon, and love wearing them so much so I hope to pick up a few other colours! The only thing I will say is be careful how you store these lip butter's as they do melt, Lollipop must have got hot in my bag and has become very soft! They are currently available at boots and are £7.99 each. Have any of you been able to get any of the Lip butters? In Love with Dior Amber Diamonds! 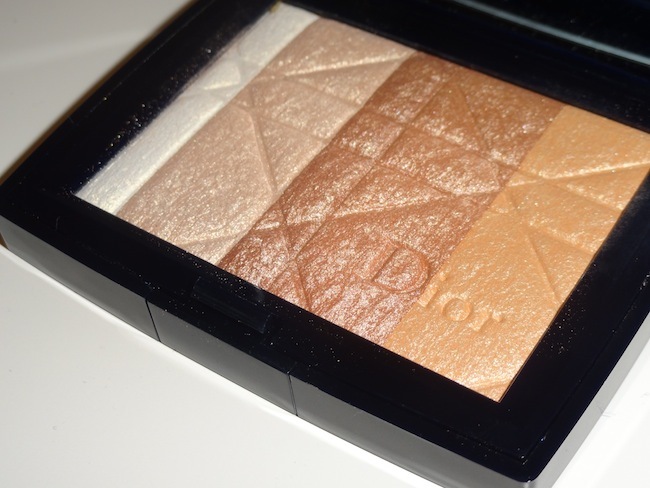 I know Dior Amber Diamonds is not a new product and last summer it seemed to be a blogger cult, but for one reason or another I never picked it up until about 2 weeks ago but boy it wasn't easy! 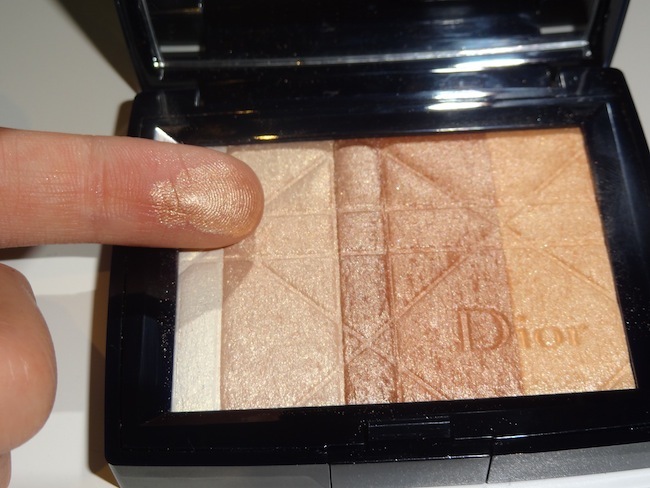 The reason I gave myself the impossible mission of finding Dior Amber Diamonds was because panic set in when I realised it had been discontinued and being over dramatic I felt my life was incomplete without this highlighter! So I dragged my poor boyfriend all over London from Harrods to Selfridges and everything inbetween just to find this bloomin highlighter, you should of heard him he did not understand why this one was so special, men! But I had no luck. Then whilst on my lunch break, I popped to the House of Fraser in the city just on a complete whim and thought I might as well see if that Dior counter had any left, having little faith. But my luck was in that day and they had a couple of days and I bought it without any hesitation I have never whipped the plastic out so quickly! Anyway enough of the X Factor build up story and onto the product in question! 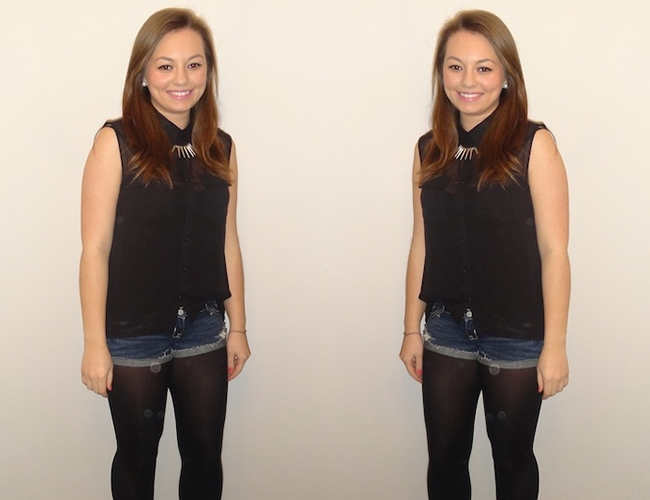 Weekend OOTD- I like Short Shorts! How has your weekend been?! Doesn't it go sooo fast I can't believe it is Monday already and I am back to work boo. I was home in Sussex this weekend and was going out with some friends Saturday night and this is what I wore. 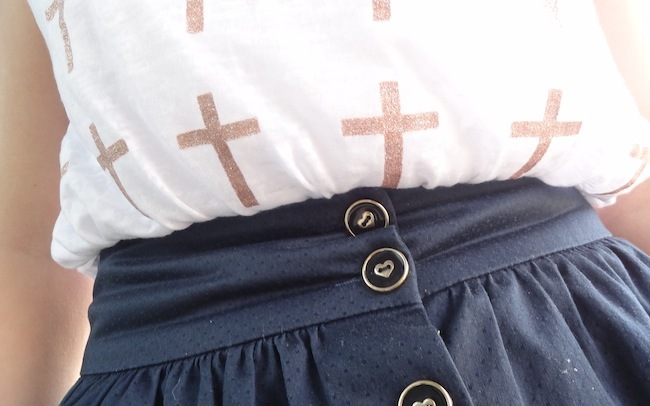 This is an outfit I literally chucked together in a panic and the realisation dawned on me that I had left all my jeans in London, and managed to pack 2 pairs of shorts ( I need to work on packing.) Anyway I am not normally one to wear denim shorts with tights, I think some people wear too sheer black tights and it just looks wrong. But I had no choice in the matter, I found my thickest tights and chucked them on, and surprisingly really liked how they looked. I feel they give a relaxed but still smart enough look to go out for drinks, and I feel way more comfortable wearing these with tights then I have ever wearing them without! I would like to note these short shorts are strictly for summer holidays you won't catch me strutting round Oxford Street in them! haha. I also love this necklace at the moment it is the only 'statement' one I own and I have been wearing it at any given opportunity! 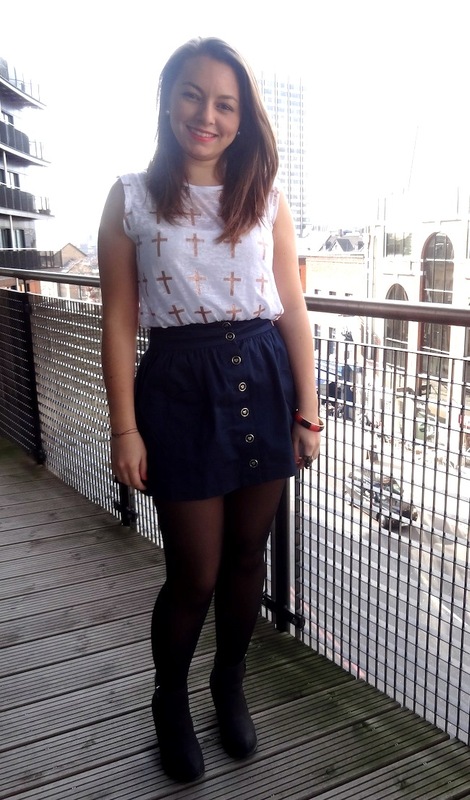 Do you wear shorts with tights? I think I have now been converted! I'm sure many of you have seen and read about Mac's Watch me simmer from the new Shop, Shop, Cook, Cook collection. 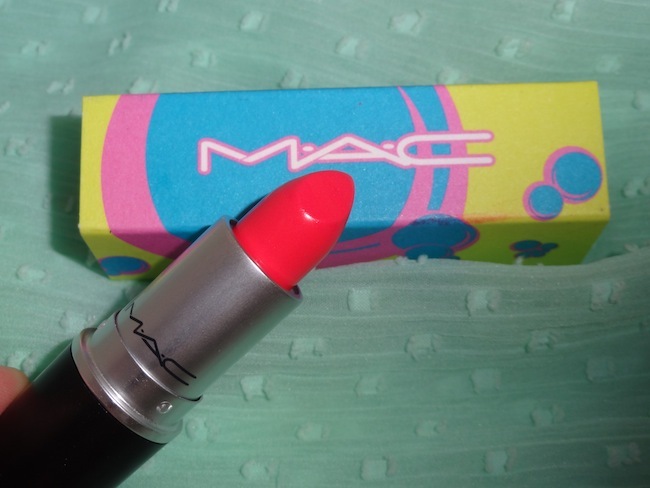 It seems to be the lipstick to have from that collection and being a sucker for coral's and for Mac I got sucked into the 'hype' ( I don't like that word but can't think of a better way to phrase it) of this lipstick. Also the packaging had something to do with it, whenever there is different/limited edition packaging I'm easily swayed! Now this lipstick like Viva Glam Nicki seems to wear differently on everyone, on some people this lipstick seems very orange/bright coral where as on me it leans more towards a pinky coral. Now me being someone who doesn't waver from their comfort zone, when I was trying this lipstick on I did think I had something similar. It looked very similar to Gosh- Shocking Coral a lipstick I wore a lot on my holiday last summer, holiday is normally the time I feel my bravest and wear corals rather than pinks ha ha ! 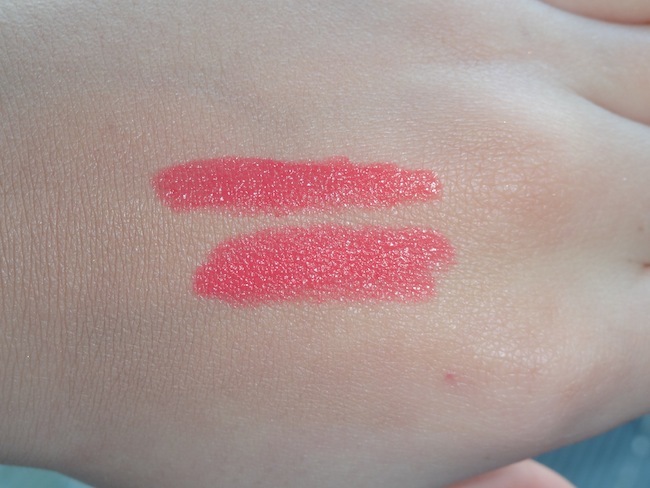 When I compared them together they looked very similar, keeping in mind my lips are pink as it is, which is why on me both of these lipsticks turn up more pinky coral than orange and in my eyes look so similar. 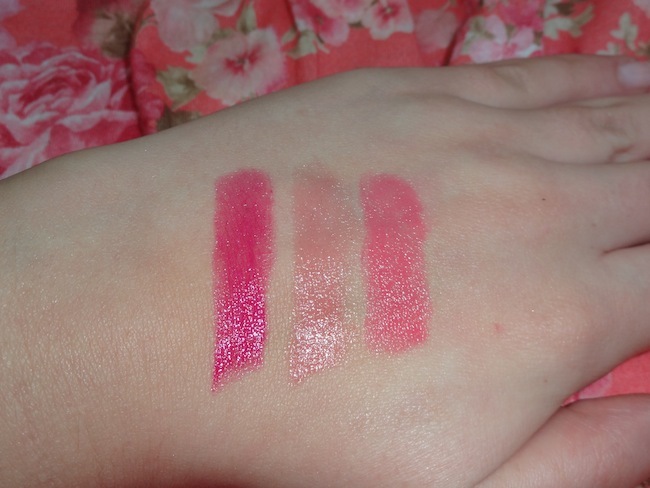 The Gosh lipsticks are £6.49 and Shocking Coral is in the Velvet touch range, so if you are struggling to get your hands on Mac's Watch me simmer or want something similar I recommend checking it out at your nearest superdrug :) What do you think? As it felt like spring I painted my nails with Chanel Miami Peach this is a nail polish I bought last summer at the airport flying out on holiday, and every time I wear it it reminds of me of that holiday as it was all I wore. 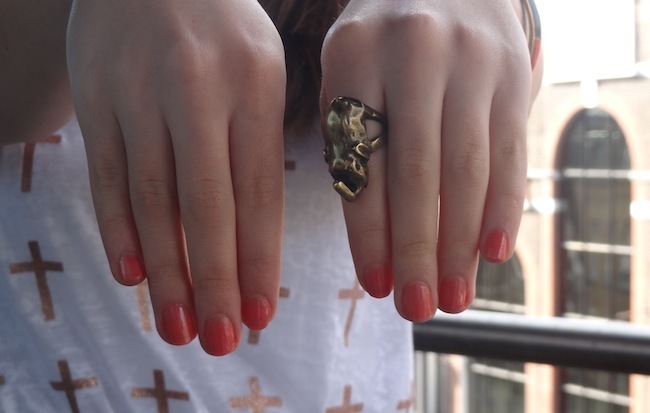 Its a lovely corally peach shade with slight shimmer running through it. I find this polish lasts a while with a good top coat and doesn't chip straight away like I know some people find happens with Chanel polishes. Finally something exciting happened to me today after ages searching across London for Dior Amber diamonds,( I seemed to have mentally decided I needed this once I found out it was being discontinued , talk about making hard work for myself) I finally found it at the Local House of Fraser near my office. I had been searching online and everything so on a total whim I popped into House of Fraser and thought I might as well ask and they had one! I was very happy :) Has this ever happened to you? 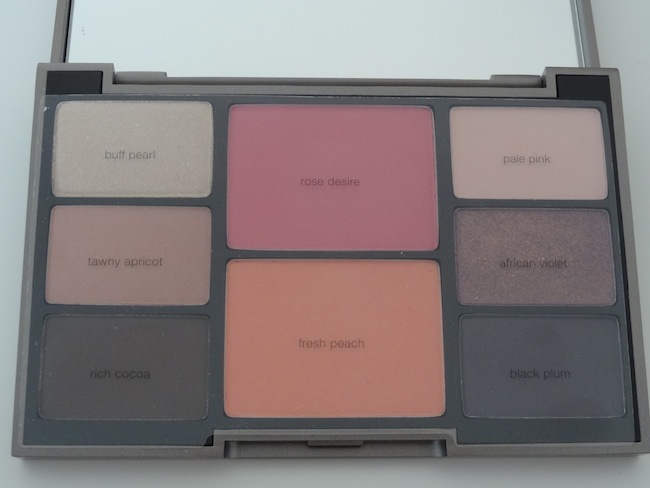 I stumbled across this palette on the Space NK website about a week before pay day and instantly fell in love with it. I had to patiently wait until pay day then I raced out and got it. It was pretty hard to track down, I had to go to three stores and I finally got the last one, so I'm not sure if it was just limited edition and there were only a few left floating around. 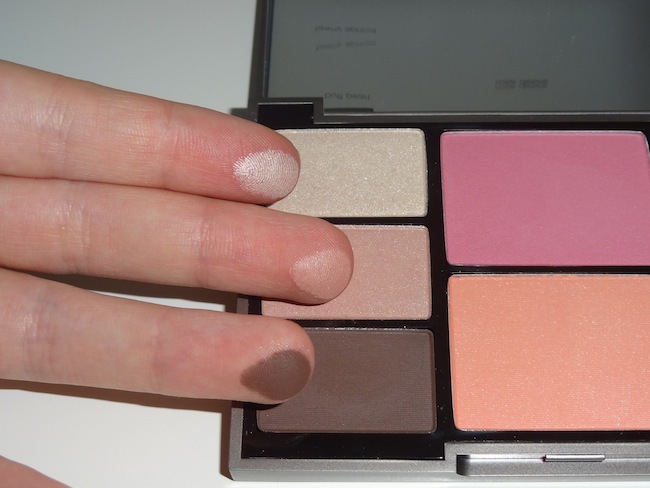 Anyway It seemed to be everything you needed in one palette, it had natural eyeshadows, smokey shadows and two lovely natural blushers. 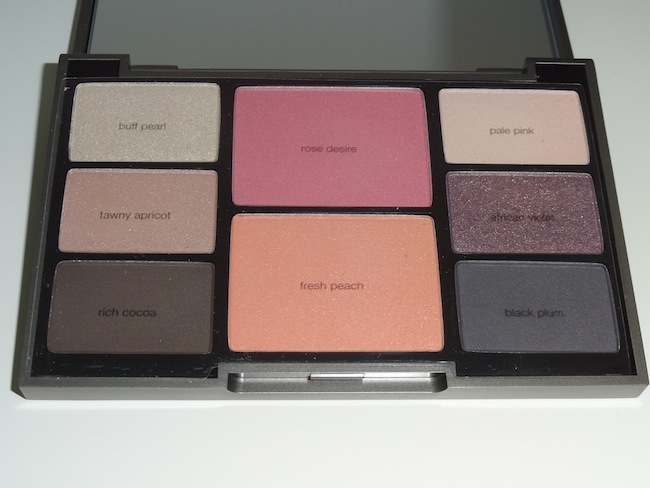 There is a great mix of shimmer and matte eyeshadows in this palette so there is something for every occasion. Isn't African Violet so pretty and different?! 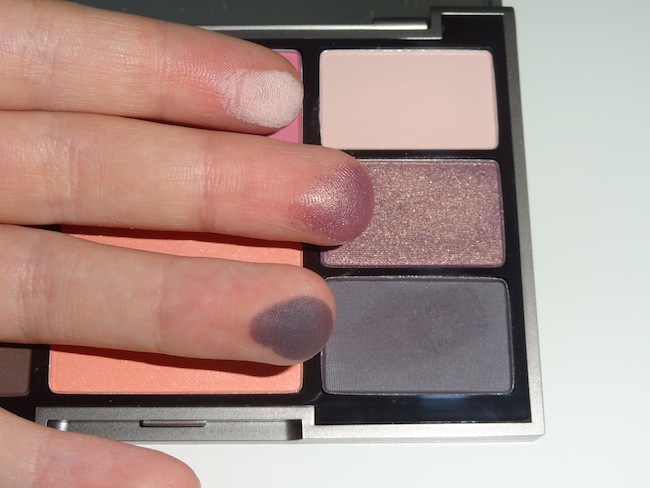 this was the eyeshadow I was most excited about in this palette, it is a lovely purple colour that has gold shimmer running through it and the pigmentation is fantastic! With African Violet it is one of those eyeshadow's that depending on the light, the colour of the shimmer somewhat changes, which why it is so unique to anything else I own. 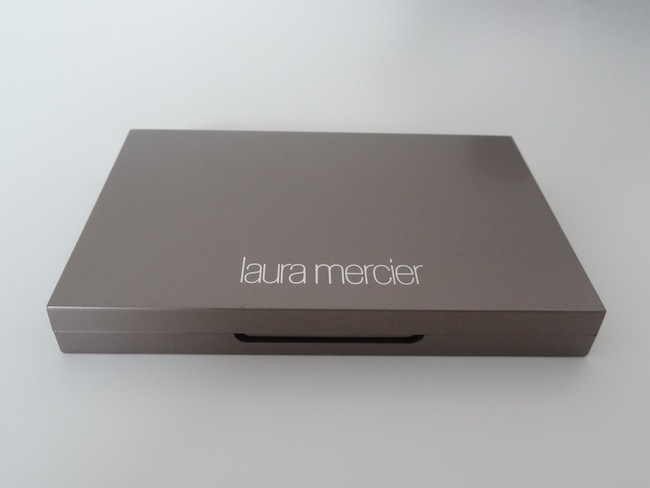 The packaging itself it very sleek, simple and lightweight so would be perfect for travelling. This post will be photo heavy so I apologise now! (Top-Bottom) Buff Pearl - This is as the name suggests a gorgeous shimmery pearl shadow, pigmentation is good it feels and goes on smoothly. This makes a nice highlight colour. Tawny Apricot- This along with African Violet is my favourite eyeshadow in this palette. It is a gorgeous versatile pinky champagne colour with slight shimmer. I have worn this by itself on my lids as a wash of colour and also used it along with Black Plum which you can see below. Rich Cocoa- What palette wouldn't be complete without a rich dark brown colour?! 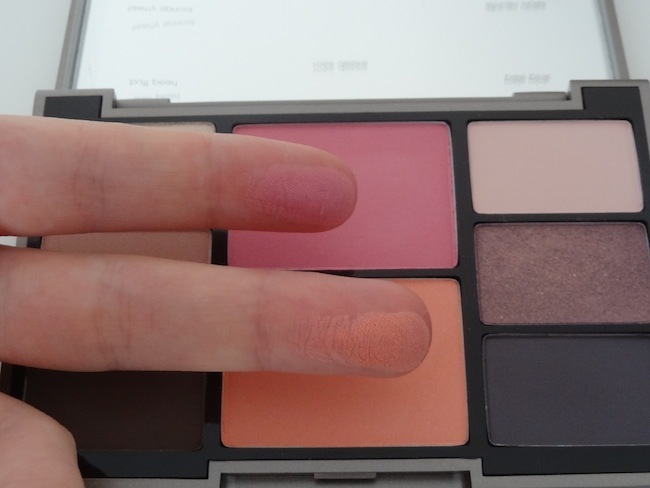 This eyeshadow is a matte shade different to the other two above and I think would look good with Tawny Apricot and pale pink. I would also pair this colour with my Mac Woodwinked as I don't actually own a matte brown shade for a nice smokey eye. The top photo is taken with flash and the below one is in natural daylight. Rose Desire- Rosey pink colour, perfect for a natural look and flush of colour. Fresh Peach - I was more interested in this shade than Rose desire, purely as I am trying to wear less pink blushers and wear more peachy shades. This is really exactly as the name suggests a peach shade with fine shimmer in it. This is great if you are heavy handed as there is no way you can go OTT and have orange cheeks! Pale Pink - This is a matte creamy pink shade, again would make a nice highlight or is nice as a light wash of colour over your lids. African Violet - I have already talked about this eyeshadow above so I will keep it short it is a gorgeous purple with gold shimmer running through it. I feel it is very different to anything else I have seen and owned. Black Plum - This is a matte very dark grey/ navy shade again another shade I don't have in my collection. 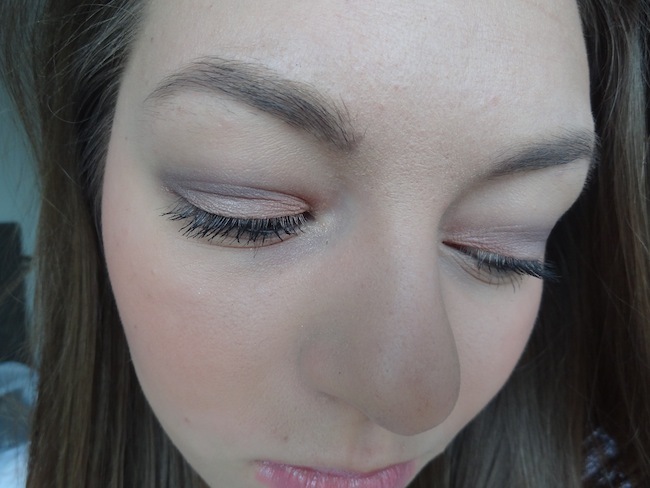 It is really great for a smokey eye, and is a lot less harsh than using a black eyeshadow. In the below picture I have used Black Plum in my crease and tawny apricot all over my lid and I really like the look and combination. I normally only wear very natural bronze's and gold's so this is a nice change for me :) I also have fresh peach on my cheeks. 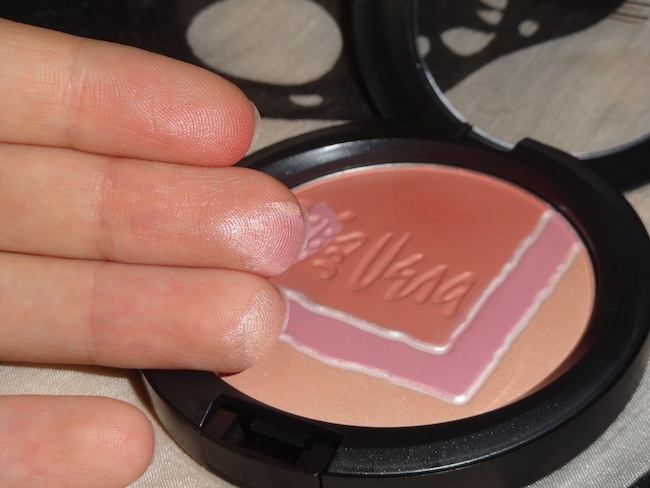 Mac Flower Fantasy is from the new Vera collection and I made a mental note of this pearlmatte face powder about a month ago when the press releases on the collection were floating around the internet. With this face powder you get 12g of product compared to the MSF where you get 6.5g so you get a lot for your money! I chose Flower fantasy over Sunday Afternoon purely because I have a lot of pink blushers and it didn't show up as much on my cheeks as Flower fantasy does. Also Flower fantasy is a lovely warm coral and peach shades which I thought would be perfect for summer. This really is a hybrid of a blusher and a highlighter in graduating colours. I think it is cute that there is a ladybug on it I love ladybug's and it is a nice touch for spring. 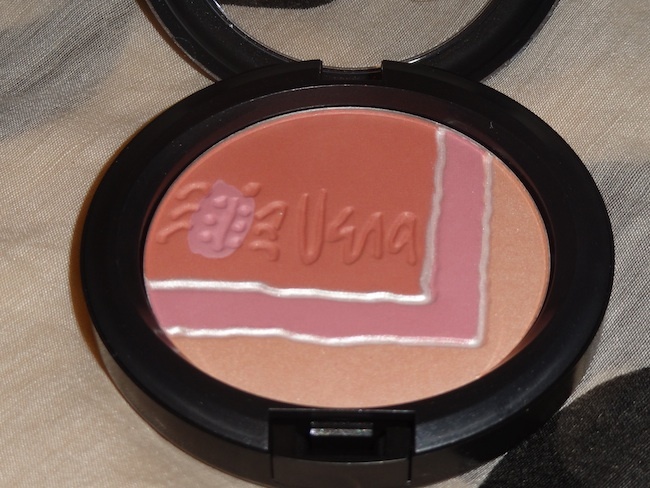 The first and largest area of this face powder is a matte warm peach shade, which I have been using as my blusher. The next shades are a shimmery dusty pink then a shimmery champagne colour both of which would make a great highlight. One thing great about this powder is that if you are heavy handed you need not worry because you would have to be rubbing your cheeks in this for you to over do it and look orange haha! There really are two ways to apply this you either swirl your brush in it which produces a lovely peachy colour with a hint of shimmer. 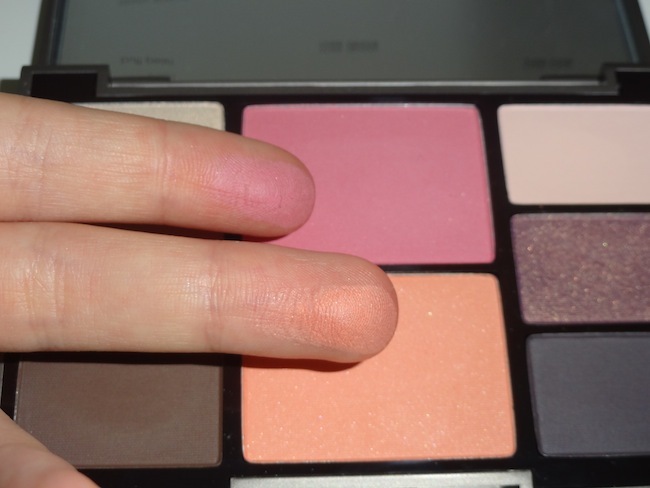 Or you can use a brush to pick out the warm peach as your blusher then use either of the other two as a highlight. Have any of you bought anything from the new Vera Collection? I know what you're thinking ANOTHER mac lip product review Ellie, really?? Yes really! I can't help it it is a sick addiction I went into Mac with the full intentions to buy something completely different then got swept up in the whole excitement of new collections and swatching all the lovely new colours that I came out with this lipgloss and a new lipstick ( it will follow in another post.) Oh *sigh* my bank balance hates me and Mac loves me. Don't even get my started on the Tour De Fabulous lipgloss collection I didn't even bother looking at those it would of been to much to handle haha, I think I'm sounding like a mad woman now so I'll get started with this review! Force of Love is from the Chenman Love and Water collection. This collection is a collaboration with Begijing- born fashion photographer Chen Man and is inspired by her infatuation of love and water. 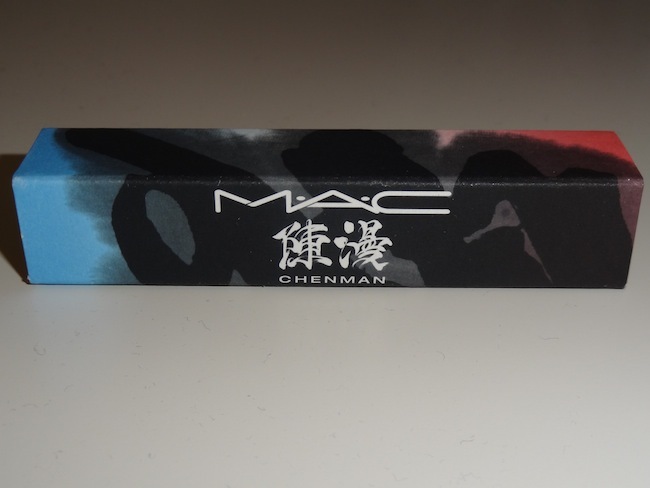 First off I love the packaging/sleeve of this lipgloss, I think it such a nice touch when Mac does this it always makes the product seem more exciting and different when it is packaged nice. 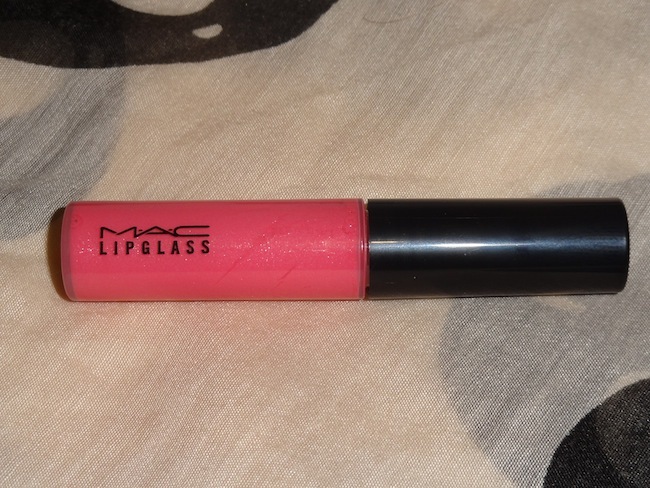 This lipglass is a lovely medium pinky leaning towards coral colour. When I initially saw this lipgloss I though of Mac's pink poodle but this is yellow based and Pink Poodle is blue based so Force of Love is less in your face and I think personally more wearable. This lipgloss is semi opaque so it is really build able, in the above picture I have just used one layer as that is how I would wear it on a day to day basis. It also has really subtle white shimmer running through it, but it isn't in your face so is very wearable for the day time.